Crazy Golf: World Tour is another budget-tastic bargain bin filler that serves to remind us of why we pay bigger bucks for better games. 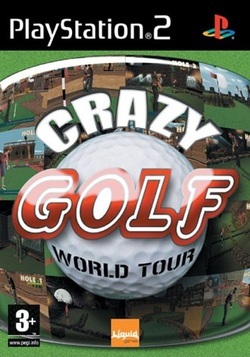 The golfing in question is less ‘crazy’ and more ‘briefly diverting’, whilst World Tour would have been a more apt sub-heading had the world in actuality consisted of nothing more than three holiday resort style crazy golf courses. Still, for a game that boasts ‘colourful characters’ as a genuine selling point and brags (nay, threatens) of a free Bratz top trumps card on its cover, things could have been worse. Essentially, it’s one half a golf game in the sense that it focuses, inevitably enough, on the putting element, with no drives, chips or tee shots necessary. Whilst this sounds limiting, the obstacle course layouts offer their own conundrums, whilst the pull-back-and-shoot analogue control method is actually a lot less rickety than some of the more wayward Tiger Woods games of the time. But despite seemingly housing the right tools for some prolonged play through its Career, Tournament and Speed rounds, CGWT somewhat conspires towards its own downfall. It feels casual and non-committal; hardly conducive to welcoming the player back for more sessions, and most of the modes are marred by a rather quaint, lonesome feel. Tournament sees you playing on your own, with no A.I. competitors as a benchmark, trying to score a low round. Career sees you again on your lonesome, trying to card as many pars or better, whilst Speed has you golfing at a rapid pace in order to complete a quick round, and you guessed it, you’re on your own. There are no characters, clubs or special features to unlock, no reward for overall completion. You just play for a little while until something more sprightly grabs your attention. The Wild West course makes for a nice introduction and is the game’s best course, offering a smart but fair mix of gradients and hazards, requiring decisive timing and a good feel for power from the player. Ghost Town and Pirate Cove sadly don’t expand on the foundations laid down in the first, with a potentially-challenging slopes system rarely being put to imaginative use (especially in close proximity to the hole itself). The gameplay doesn’t really develop, save for the odd murderous difficulty spike here and there as you get routinely robbed by a couple of near-impossible holes. A lacklustre visual engine throws in some dodgy glitches and characters that look lame and tacky, like Sims­-rejects who’ve been drafted into an obscure golf game at the last minute, their animations embarrassingly limited. Courses follow a similar tack, proving functional but extremely basic and a long way short of what the PS2 can offer from a technical standpoint. Greens appear generally low-rent and there is nothing to speak of in terms of interesting scenery or middle-distance eye-candy, whilst the menus are nasty and bland. The dreadfully morose, one-track elevator music lends the whole game an insidious sense of disinterest, and after being subjected to more than half an hour of it, you’d rather pour cement down your ears than listen any longer. It will come as little surprise that the character voicing is entirely without merit, and the whole audio side of the game strikes you as an unwanted distraction in the developers’ humble quest to make a crazy golf game. If I’m being kind, Crazy Golf: World Tour wouldn’t have been any worse if they’d just foregone the sound entirely. Where it does retain a semblance of interest is in its pass-the-pad multiplayer, a throwback to the accessible party game ethos which was at its height in the mid-late nineties. CGWT is accessible and without the complications of spin, driving and wind direction to factor in, it’s something you can jump into even without having accrued much gaming mileage. Its ambitions are extremely modest though, and whilst the base gameplay is competent, there’s precious little memorable about a game that comes to feel like little more than an expanded Flash game. An almost-mercenary lack of passion and creativity in the development cycle transmits as a video game that is cold and impersonal to play, sorely lacking the innovative spirit of better budget titles. It goes without saying; there are an awful lot of golf games out their more worthy of your time.